“DADD. 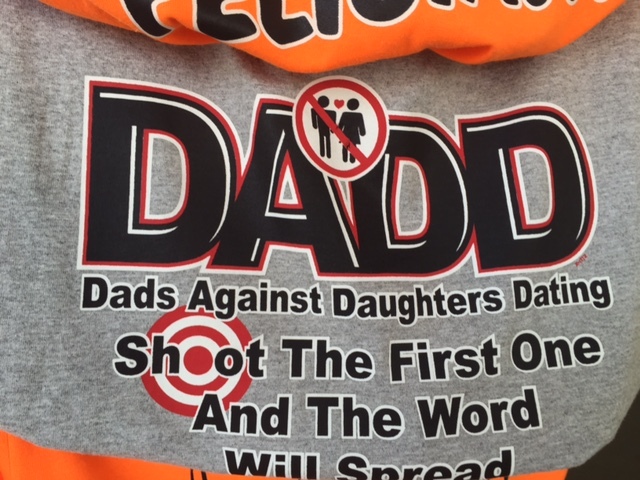 Dads Against Daughters Dating. Shoot the First One and the Word Will Spread.” I saw these words on a t shirt at a gift shop in the Wisconsin Dells and nearly choked on my walnut fudge. It made me think of my own Dad. He had rules about dating when I was a teen. I had to be home no later than 10 pm. He had to know exactly where we would be going. No dashing out at the sound of a car honk. My dates were required to ring the bell, come into the house and be properly introduced. And every time, Mom would be harmlessly puttering in the kitchen but Dad would be in his basement workshop loading shot gun shells. Most of the time, all of dad’s protectiveness annoyed me as it would any teen girl. But I remember a night I was glad to have that kind of dad. I’d had a date with a guy I wasn’t that into. When he brought me home, he walked me to my back door and made what I will politely call “a pass” at me. I had the perfect way out. I just leaned back on the door bell and Dad was there in a flash. Having been introduced to Dad in his workshop earlier, “Romeo” skedaddled without even a parting glance. Romance over. When my first marriage ended, I was concerned that Dad might seek some sort of revenge. But he was just glad for me to be done with him and kept his feelings in check. Then there was the time I brought my future second husband over to meet my parents for the first time. Tom was trying really hard to win my two boys over and wanted to show my parents that he was a good prospect for me. He bought the boys two of those small balsa wood airplanes. The second we arrived, Sam and Ben launched their planes into a quick high arc landing them both high up in a birch tree. Dad, standing shirtless in the driveway, said, “I’ll take care of that,” went in the house, came out with a shot gun and blasted them both out of the tree with two rapid shots destroying the planes in the process. No “Hello, glad to meet you.” Nothing. Tom, a guy who would never even consider owning a gun, froze with his mouth agape and mumbled, “What kind of hillbilly family am I getting mixed up with?” Being used to their grandfather and the stuff he does, the kids merely shrugged at the loss of the planes and the evening went on as if nothing happened. Dad still hunts some and loads shot gun shells in the basement although that’s long faded as a threatening activity to anyone including deer. Yet, I still think of him as my protector. The guy who will do anything he can to prevent me from harm, especially in the form of a male human.